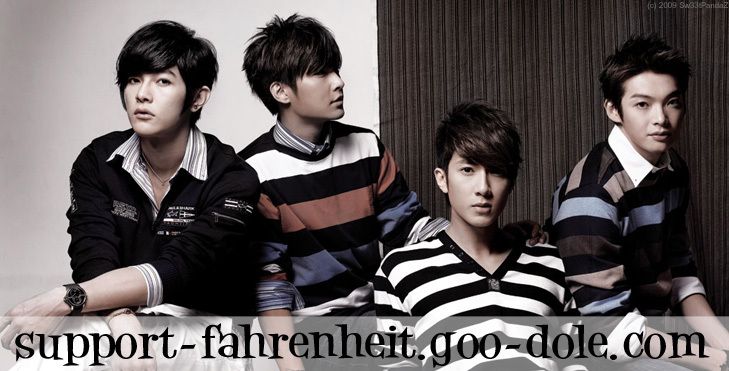 Hi everyone I just registered yesterday so I'm super excited to make friends with FAHRENHEIT lovers and fans as me! I was reading a lot of the post and its funny cuz i also found this site off of google. So i'm pretty glad i found this site cuz for 1 thing its in ENGLISH lol. hmm my favorite member is of course DADONG JIRO WANG!! I LOVE LOVE LOVE HIM! i also love the other members too and I definitely love FLH! i hope to see them live in concert one day. but too bad they'll never come to the US. so I will go to them! lol ok i sound like a crazy stalker freak, but believe me i'm just a fan! only a little bit too obsess! Lol. Welcome to the forum. Its funny you think you sound stalkery cuzz looking at my username I think I sound more stalkery. I'm Jenny. Obviously I love Aaron. Ahhhh another U.S. fan. I wish they would come here too!!!! aww thanks for the warm greetings you guys... so any of u two seen fahrenheit live in concert? or would like too? sighs why can't i be born in taiwan! lol seeing them perform live is one of my dreams. especially meeting jiro in person.